Interference and Pearlescent colours appear almost colourless but when applied over a dark colour they bounce back gleaming colour. The interference colour take on different hues depending on the point of view and how the light is striking them. Viewed from one angle, Interference Green is a shimmering, pearly green. Viewed from another angle, it refracts a reddish hue. Daniel Smith Luminescent watercolours, unlike anything ever seen in watercolour, simulate the glitter of a watery surface or the lustre of mother-of-pearl. They're made from mica pigment, thin transparent particles coated with highly reflective metal oxides. Duochrome watercolours alternate between two distinct colours depending on the reflective light. Duochrome Adobe shifts between saturated copper and a brilliant red metallic. Daniel Smith Luminescent watercolours, unlike anything ever seen in watercolour, simulate the glitter of a watery surface or the luster of mother-of-pearl. They're made from mica pigment, thin transparent particles coated with highly reflective metal oxides. Duochrome watercolours alternate between two distinct colours depending on the reflective light. Duochrome Aquamarine shifts between a soft blue-green and a shimmering iridescent blue. Daniel Smith Luminescent watercolours, unlike anything ever seen in watercolour, simulate the glitter of a watery surface or the lustre of mother-of-pearl. They're made from mica pigment, thin transparent particles coated with highly reflective metal oxides. Duochrome watercolours alternate between two distinct colours depending on the reflective light. Duochrome Arctic Fire shows its colours best over black paper or darker watercolour; it shifts from reflective green to violet. Daniel Smith Luminescent watercolours, unlike anything ever seen in watercolour, simulate the glitter of a watery surface or the lustre of mother-of-pearl. They're made from mica pigment, thin transparent particles coated with highly reflective metal oxides. Duochrome watercolours alternate between two distinct colours depending on the reflective light. Duochrome Autumn Mystery is an earthy russet that shifts to a vibrant copper metallic. Daniel Smith Luminescent watercolours, unlike anything ever seen in watercolour, simulate the glitter of a watery surface or the lustre of mother-of-pearl. They're made from mica pigment, thin transparent particles coated with highly reflective metal oxides. Duochrome watercolours alternate between two distinct colours depending on the reflective light. Duochrome Blue Pearl shifts between a shimmering sky blue and a reflective cool silver. Daniel Smith Luminescent watercolours, unlike anything ever seen in watercolour, simulate the glitter of a watery surface or the lustre of mother-of-pearl. They're made from mica pigment, thin transparent particles coated with highly reflective metal oxides. Duochrome watercolours alternate between two distinct colours depending on the reflective light. Duochrome Cabo Blue adds a third reflective colour shifting from blue to metallic gold, then finishing with a shimmering metallic blue. Daniel Smith Luminescent watercolours, unlike anything ever seen in watercolour, simulate the glitter of a watery surface or the lustre of mother-of-pearl. They're made from mica pigment, thin transparent particles coated with highly reflective metal oxides. Duochrome watercolours alternate between two distinct colours depending on the reflective light. Duochrome Cactus Flower shifts between an earthy sienna and a sparkling metallic violet. Daniel Smith Luminescent watercolours, unlike anything ever seen in watercolour, simulate the glitter of a watery surface or the lustre of mother-of-pearl. They're made from mica pigment, thin transparent particles coated with highly reflective metal oxides. Duochrome watercolours alternate between two distinct colours depending on the reflective light. Duochrome Desert Bronze shifts between an earthy terra cotta and a brilliant metallic jade. Daniel Smith Luminescent watercolours, unlike anything ever seen in watercolour, simulate the glitter of a watery surface or the lustre of mother-of-pearl. They're made from mica pigment, thin transparent particles coated with highly reflective metal oxides. Duochrome watercolours alternate between two distinct colours depending on the reflective light. Duochrome Emerald shifts between two different shades of green—a lovely emerald and a reflective green-gold. Daniel Smith Luminescent watercolours, unlike anything ever seen in watercolour, simulate the glitter of a watery surface or the lustre of mother-of-pearl. They're made from mica pigment, thin transparent particles coated with highly reflective metal oxides. Duochrome watercolours alternate between two distinct colours depending on the reflective light. Duochrome Green Pearl shifts between shimmering sea green and reflective metallic sliver. Daniel Smith Luminescent watercolours, unlike anything ever seen in watercolour, simulate the glitter of a watery surface or the lustre of mother-of-pearl. They're made from mica pigment, thin transparent particles coated with highly reflective metal oxides. Duochrome watercolours alternate between two distinct colours depending on the reflective light. Duochrome Hibiscus shifts between red violet and a shimmering iridescent blue violet. Daniel Smith Luminescent watercolours, unlike anything ever seen in watercolour, simulate the glitter of a watery surface or the lustre of mother-of-pearl. They're made from mica pigment, thin transparent particles coated with highly reflective metal oxides. Duochrome watercolours alternate between two distinct colours depending on the reflective light. Duochrome Lapis Sunlight shows its colours best over black paper or darker watercolour; it shifts from reflective green to blue. Daniel Smith Luminescent watercolours, unlike anything ever seen in watercolour, simulate the glitter of a watery surface or the lustre of mother-of-pearl. They're made from mica pigment, thin transparent particles coated with highly reflective metal oxides. Duochrome watercolours alternate between two distinct colours depending on the reflective light. Duochrome Mauve shifts between pale pinkish-purple and brilliant sparkling sapphire. Daniel Smith Luminescent watercolours, unlike anything ever seen in watercolour, simulate the glitter of a watery surface or the lustre of mother-of-pearl. They're made from mica pigment, thin transparent particles coated with highly reflective metal oxides. Duochrome watercolours alternate between two distinct colours depending on the reflective light. Duochrome Oceanic shifts between a subtle green gold and a brilliant metallic gold sparkle. Daniel Smith Luminescent watercolours, unlike anything ever seen in watercolour, simulate the glitter of a watery surface or the lustre of mother-of-pearl. They're made from mica pigment, thin transparent particles coated with highly reflective metal oxides. Duochrome watercolours alternate between two distinct colours depending on the reflective light. Duochrome Saguaro Green shifts between rich copper and brilliant metallic green-gold. Daniel Smith Luminescent watercolours, unlike anything ever seen in watercolour, simulate the glitter of a watery surface or the lustre of mother-of-pearl. They're made from mica pigment, thin transparent particles coated with highly reflective metal oxides. Duochrome watercolours alternate between two distinct colours depending on the reflective light. Duochrome Tropic Sunrise shows its colours best over black paper or darker watercolour; it shifts from reflective green to red. Daniel Smith Luminescent watercolours, unlike anything ever seen in watercolour, simulate the glitter of a watery surface or the lustre of mother-of-pearl. They're made from mica pigment, thin transparent particles coated with highly reflective metal oxides. Duochrome watercolours alternate between two distinct colours depending on the reflective light. Duochrome Turquoise shifts between a vibrant Caribbean blue and a sparkling sea green. Daniel Smith Luminescent watercolours, unlike anything ever seen in watercolour, simulate the glitter of a watery surface or the lustre of mother-of-pearl. They're made from mica pigment, thin transparent particles coated with highly reflective metal oxides. Duochrome watercolours alternate between two distinct colours depending on the reflective light. Duochrome Violet Fantasy shows its colours best over black paper or darker watercolour; it shifts from reflective violet to green. Daniel Smith Luminescent watercolours, unlike anything ever seen in watercolour, simulate the glitter of a watery surface or the lustre of mother-of-pearl. They're made from mica pigment, thin transparent particles coated with highly reflective metal oxides. Duochrome watercolours alternate between two distinct colours depending on the reflective light. Duochrome Violet Pearl shifts between shimmering soft lavender and reflective cool sliver. Daniel Smith Luminescent watercolours, unlike anything ever seen in watercolour, simulate the glitter of a watery surface or the lustre of mother-of-pearl. They're made from mica pigment, thin transparent particles coated with highly reflective metal oxides. Interference pigments display a subtle sheen when used on white paper. Used on black paper, or as a glaze over dark colours, Interference Blue is a transparent and glimmering cool blue. Daniel Smith Luminescent watercolours, unlike anything ever seen in watercolour, simulate the glitter of a watery surface or the lustre of mother-of-pearl. They're made from mica pigment, thin transparent particles coated with highly reflective metal oxides. Interference pigments display a subtle sheen when used on white paper. Used on black paper, or as a glaze over dark colours, Interference Copper is a transparent and sparkling soft copper. Daniel Smith Luminescent watercolours, unlike anything ever seen in watercolour, simulate the glitter of a watery surface or the lustre of mother-of-pearl. They're made from mica pigment, thin transparent particles coated with highly reflective metal oxides. Interference pigments display a subtle sheen when used on white paper. Used on black paper, or as a glaze over dark colours, Interference Gold is a twinkling and transparent warm gold. Daniel Smith Luminescent watercolours, unlike anything ever seen in watercolour, simulate the glitter of a watery surface or the lustre of mother-of-pearl. They're made from mica pigment, thin transparent particles coated with highly reflective metal oxides. Interference pigments display a subtle sheen when used on white paper. Used on black paper, or as a glaze over dark colours, Interference Green is a glimmering and transparent emerald. Daniel Smith Luminescent watercolours, unlike anything ever seen in watercolour, simulate the glitter of a watery surface or the lustre of mother-of-pearl. They're made from mica pigment, thin transparent particles coated with highly reflective metal oxides. Interference pigments display a subtle sheen when used on white paper. 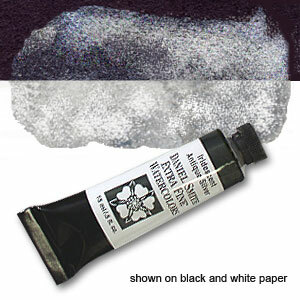 Used on black paper, or as a glaze over dark colours, Interference Lilac glows with a transparent shine of violet. Daniel Smith Luminescent watercolours, unlike anything ever seen in watercolour, simulate the glitter of a watery surface or the lustre of mother-of-pearl. They're made from mica pigment, thin transparent particles coated with highly reflective metal oxides. Interference pigments display a subtle sheen when used on white paper. Used on black paper, or as a glaze over dark colours, Interference Red sparkles with a light red shimmer. Daniel Smith Luminescent watercolours, unlike anything ever seen in watercolour, simulate the glitter of a watery surface or the lustre of mother-of-pearl. They're made from mica pigment, thin transparent particles coated with highly reflective metal oxides. Interference pigments display a subtle sheen when used on white paper. Used on black paper, or as a glaze over dark colours, Interference Silver shines with an icy veil of transparent silver. Daniel Smith Luminescent watercolours, unlike anything ever seen in watercolour, simulate the glitter of a watery surface or the lustre of mother-of-pearl. They're made from mica pigment, thin transparent particles coated with highly reflective metal oxides. Iridescent colours reflect light and their semi-transparent quality adds a fascinating sense of depth to your work. Iridescent Antique Bronze is among the darkest luminescent colours with its warm metallic bronze sheen. Daniel Smith Luminescent watercolours, unlike anything ever seen in watercolour, simulate the glitter of a watery surface or the lustre of mother-of-pearl. They're made from mica pigment, thin transparent particles coated with highly reflective metal oxides. Iridescent colours reflect light and their semi-transparent quality adds a fascinating sense of depth to your work. Iridescent Antique Copper is a burnished cinnamon tone with a dark, saturated quality. Daniel Smith Luminescent watercolours, unlike anything ever seen in watercolour, simulate the glitter of a watery surface or the lustre of mother-of-pearl. They're made from mica pigment, thin transparent particles coated with highly reflective metal oxides. Iridescent colours reflect light and their semi-transparent quality adds a fascinating sense of depth to your work. Iridescent Antique Gold has a deep shine without the bright, brassy quality found in some metallic gold watercolours. Daniel Smith Luminescent watercolours, unlike anything ever seen in watercolour, simulate the glitter of a watery surface or the lustre of mother-of-pearl. They're made from mica pigment, thin transparent particles coated with highly reflective metal oxides. Iridescent colours reflect light and their semi-transparent quality adds a fascinating sense of depth to your work. Iridescent Antique Silver is a pewter shade that is deeper in tone than other metallic silver watercolours. Daniel Smith Luminescent watercolours, unlike anything ever seen in watercolour, simulate the glitter of a watery surface or the lustre of mother-of-pearl. They're made from mica pigment, thin transparent particles coated with highly reflective metal oxides. Iridescent colours reflect light and their semi-transparent quality adds a fascinating sense of depth to your work. Iridescent Aztec Gold is a warm reddish shade midway between traditional copper and gold hues. Daniel Smith Luminescent watercolours, unlike anything ever seen in watercolour, simulate the glitter of a watery surface or the lustre of mother-of-pearl. They're made from mica pigment, thin transparent particles coated with highly reflective metal oxides. Iridescent colours reflect light and their semi-transparent quality adds a fascinating sense of depth to your work. Iridescent Blue Silver is a rich metallic steel tone. Daniel Smith Luminescent watercolours, unlike anything ever seen in watercolour, simulate the glitter of a watery surface or the lustre of mother-of-pearl. They're made from mica pigment, thin transparent particles coated with highly reflective metal oxides. Iridescent colours reflect light and their semi-transparent quality adds a fascinating sense of depth to your work. Iridescent Bronze is highly reflective with a warm bronze sheen. Daniel Smith Luminescent watercolours, unlike anything ever seen in watercolour, simulate the glitter of a watery surface or the lustre of mother-of-pearl. They're made from mica pigment, thin transparent particles coated with highly reflective metal oxides. Iridescent colours reflect light and their semi-transparent quality adds a fascinating sense of depth to your work. Iridescent Copper is the bright and reflective colour of a newly minted penny. Daniel Smith Luminescent watercolours, unlike anything ever seen in watercolour, simulate the glitter of a watery surface or the lustre of mother-of-pearl. Daniel Smith Luminescent watercolours, unlike anything ever seen in watercolour, simulate the glitter of a watery surface or the lustre of mother-of-pearl. They're made from mica pigment, thin transparent particles coated with highly reflective metal oxides. Iridescent colours reflect light and their semi-transparent quality adds a fascinating sense of depth to your work. Iridescent Garnet is a rose coloured metallic that creates a dynamic pink reflection even in light washes. Daniel Smith Luminescent watercolours, unlike anything ever seen in watercolour, simulate the glitter of a watery surface or the lustre of mother-of-pearl. They're made from mica pigment, thin transparent particles coated with highly reflective metal oxides. Iridescent colours reflect light and their semi-transparent quality adds a fascinating sense of depth to your work. Iridescent Gold is the quintessential gold shade – bright, reflective and regal. Daniel Smith Luminescent watercolours, unlike anything ever seen in watercolour, simulate the glitter of a watery surface or the lustre of mother-of-pearl. They're made from mica pigment, thin transparent particles coated with highly reflective metal oxides. Iridescent colours reflect light and their semi-transparent quality adds a fascinating sense of depth to your work. Iridescent Goldstone is a rich gold with a slight reddish undertone. Daniel Smith Luminescent watercolours, unlike anything ever seen in watercolour, simulate the glitter of a watery surface or the lustre of mother-of-pearl. They're made from mica pigment, thin transparent particles coated with highly reflective metal oxides. Iridescent colours reflect light and their semi-transparent quality adds a fascinating sense of depth to your work. Iridescent Jade is a shimmering soft green with a golden metallic surface. Daniel Smith Luminescent watercolours, unlike anything ever seen in watercolour, simulate the glitter of a watery surface or the lustre of mother-of-pearl. They're made from mica pigment, thin transparent particles coated with highly reflective metal oxides. Iridescent colours reflect light and their semi-transparent quality adds a fascinating sense of depth to your work. Iridescent Moonstone reflects in shades white and deep silver—a perfect choice for fish scales or moonlit water. Iridescent Moonstone shows up as a silvery-gray on white, but when applied over black becomes a glowing silver-white - like the reflection of the moon on a night-darkened sea. Daniel Smith Luminescent watercolours, unlike anything ever seen in watercolour, simulate the glitter of a watery surface or the lustre of mother-of-pearl. They're made from mica pigment, thin transparent particles coated with highly reflective metal oxides. Iridescent colours reflect light and their semi-transparent quality adds a fascinating sense of depth to your work. Iridescent Ruby is a sweet and soft metallic pink—try this colour on bird's wings or flower petals for subtle shine. Daniel Smith Luminescent watercolours, unlike anything ever seen in watercolour, simulate the glitter of a watery surface or the lustre of mother-of-pearl. They're made from mica pigment, thin transparent particles coated with highly reflective metal oxides. Iridescent colours reflect light and their semi-transparent quality adds a fascinating sense of depth to your work. Iridescent Russet is a highly saturated burnt bronze with remarkable granulating qualities. Daniel Smith Luminescent watercolours, unlike anything ever seen in watercolour, simulate the glitter of a watery surface or the lustre of mother-of-pearl. They're made from mica pigment, thin transparent particles coated with highly reflective metal oxides. Iridescent colours reflect light and their semi-transparent quality adds a fascinating sense of depth to your work. Iridescent Sapphire is a shadowy neutral from one angle that bursts into a brilliant metallic violet when the light hits it from another. Iridescent Sapphire, a subtle, silvery blue-gray on white, pops and sparkles when applied over black paper or dark colours. It has a cool elegance and mixes beautifully with other colours. Daniel Smith Luminescent watercolours, unlike anything ever seen in watercolour, simulate the glitter of a watery surface or the lustre of mother-of-pearl. They're made from mica pigment, thin transparent particles coated with highly reflective metal oxides. Iridescent colours reflect light and their semi-transparent quality adds a fascinating sense of depth to your work. Iridescent Scarab Red is a complex burgundy with a delicate surface sparkle of blue-green pigment. Daniel Smith Luminescent watercolours, unlike anything ever seen in watercolour, simulate the glitter of a watery surface or the lustre of mother-of-pearl. They're made from mica pigment, thin transparent particles coated with highly reflective metal oxides. Iridescent colours reflect light and their semi-transparent quality adds a fascinating sense of depth to your work. Iridescent Sunstone is a soft metallic pink with a glimmering gold surface. Daniel Smith Luminescent watercolours, unlike anything ever seen in watercolour, simulate the glitter of a watery surface or the lustre of mother-of-pearl. They're made from mica pigment, thin transparent particles coated with highly reflective metal oxides. Iridescent colours reflect light and their semi-transparent quality adds a fascinating sense of depth to your work. Iridescent Topaz is a pale yellow-gold with just the slightest hint of a green undertone. Daniel Smith Luminescent watercolours, unlike anything ever seen in watercolour, simulate the glitter of a watery surface or the lustre of mother-of-pearl. They're made from mica pigment, thin transparent particles coated with highly reflective metal oxides. Pearlescent colours give white paper a pearl-like lustre. Use Pearlescent Shimmer as a glaze for a snow-like glimmer or mix with other colours to add sparkle and shine. Daniel Smith Luminescent watercolours, unlike anything ever seen in watercolour, simulate the glitter of a watery surface or the lustre of mother-of-pearl. They're made from mica pigment, thin transparent particles coated with highly reflective metal oxides. Pearlescent colours give white paper a pearl-like lustre. Use Pearlescent White as a slightly opaque glimmering glaze or combine with other colours to create sparkling pastel tones. Some of the colours are outstanding but one is totally different from the colour swatch provided by Daniel Smith. Duochrome Violet Fantasy - shows nothing that could even remotely be called violet even when held in a variety of orientations. On the other hand, Duochrome Arctic Fire shows a beautiful pinkish/firey colour when tilted. Most of the tubes were full of paint but several had to be squeezed flat at the bottom before any paint came out. Looking down the tube showed the paint to be substantially below the top of the tube, although I am sure that they all contained 15ml of paint, it was just annoying to have to start folling up the tube so early on. Some colours contain a colourless 'oil' which proved impossible to mix with the paint meaning that results were patchy and had to be painted more than once which resulted in a loss of spontaneity. E.g. Duochrome Hibiscus and Duochrome Mauve but others as well. Duochrome Turquoise was wonderful to apply, responsive and high-chroma. I assume these variations are acceptable because these are high quality paints made from naturally obtained pigments and of course will vary in many features. My intention is to develop an 'expertise' and adapt to the more problematic colours because all the paints seem to be worth the effort. To have such iridescent and duo-effect colours in watercolour as opposed to acrylic paint, is wonderful and some are immediately stunning and I am sure they all will be with effort on my part. I don't resent having to develop my technique.